Each ALGALTOXKIT F contains all the materials necessary to perform two growth inhibition tests with the freshwater microalgae Selenastrum capricornutum. Easy to follow instructions and detailed illustrations are provided in the kits for the conduct of range-finding and definitive tests. The test organisms are included in the kits in algal beads from which the microalgae can easily be set free on demand, in less than 30 min, to supply the live biota for the conduct of the assays. 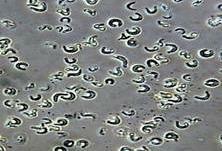 · Algal beads of high quality produced in strictly controlled conditions preclude variability associated with recruitment/ maintenance of livestock’s of microalgae in exponential growth phase, in conventional bioassays. · Highly uniform quality of the test medium is achieved by simple dilution of Concentra-ted solutions of selected chemicals, with deionizer water. · Standardized “long cell” test containers (10 cm path length) constructed of biologically inert materials ensure uniform exposure conditions. · Tubes with algal beads, concentrated algal growth and toxicant dilution medium, long cells and holding trays. · Detailed Standard Operational Procedure brochure, abbreviated Bench Protocol, OD/N regression sheet, data scoring sheets and graphical EC50 calculation sheets. · Specification sheet with batch number of the algal beads and the media. · Daily scoring of the optical density of the microalgae in the long cells takes less than 15 min. · A floppy disc for easy Toxkit data treatment can be obtained on demand. · Comparable to the sensitivity of the algal growth inhibition test with microalgae from laboratory cultures. · The ALGALTOXKIT microbiotest strictly adheres to the protocols for regulatory testing with microalgae, prescribed by international organizations such as e.g. the OECD and the ISO. The Algal Toxkit FTM is designed for the Toxicity Screeing of Pure Compounds, Effluents, Sediments, Wasterwaters, and Surface and Ground Waters. A list of selected references is available upon request. 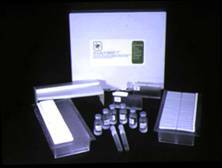 All the materials included in the ALGALTOXKIT are also available separately.